The Protestant Reformation, initiated by Martin Luther, was the most important development in church history since the apostolic age. Many people returned to biblical teachings long obscured or perverted in the Middle Ages. 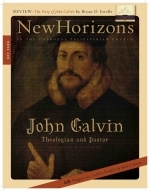 The foremost theologian of the Reformation was John Calvin (1509-64), whose five hundredth birthday we celebrate this year. What is the difference between John Calvin and Homer Simpson? At least this much: only one of them is featured on a United States postage stamp this year. The cartoon character is the honoree, and Calvin's five hundredth birthday is not acknowledged by the Postmaster General (unlike Martin Luther, who was judged to be a sufficiently significant cultural icon to have his five hundredth birthday acknowledged in 1983). Surely one of life's great pleasures is to have a worthwhile volume that fits in a coat pocket. John Calvin's so-called Golden Booklet of the True Christian Life qualifies as a most worthwhile volume, though the fit in the pocket is, in its most recent printing at least, snug.